There are few things we like more than a Chiru movie, unless of course it’s a double role Chiru movie! Rowdy Alludu features Chiranjeevi taking on two classic characters; the smooth and suave businessman Kalyan and the strong, streetwise auto driver Johnny. Add to this a dash of romance, intrigue, dastardly deeds and plenty of action and you have the perfect masala mix. 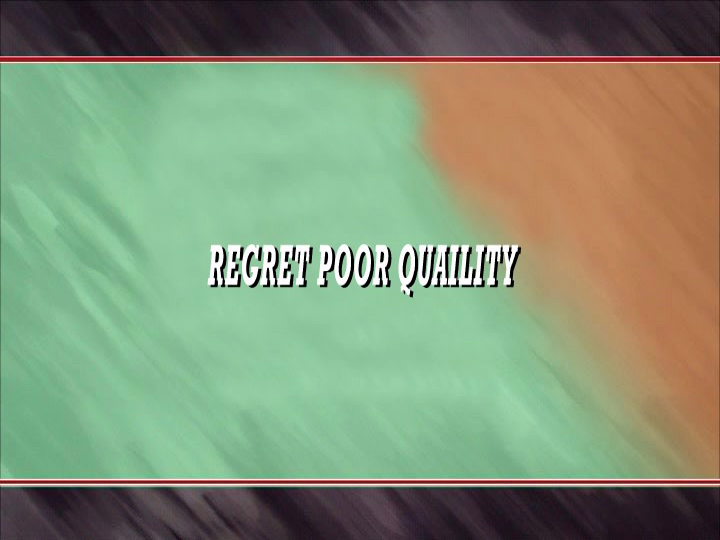 The movie starts with the above statement (which we took as A Sign) and there are a number of sections where there seem to be missing scenes as the action appears to skip. We really hope that there is someone in Hyderabad collecting and restoring, or at least preserving, all of these older films as quite a few we have watched recently have a similar problem. Kalyan arrives back from the USA to take over the family hotel business from his ailing father and naive brother-in-law. With the help of his father’s trusted employee Mr Madhavayya (Raogopalrao) he discovers irregularities in the accounts and it’s not long before he has a few suspects in mind. However, before he can investigate further, the whole family heads off to Ooty for a holiday. 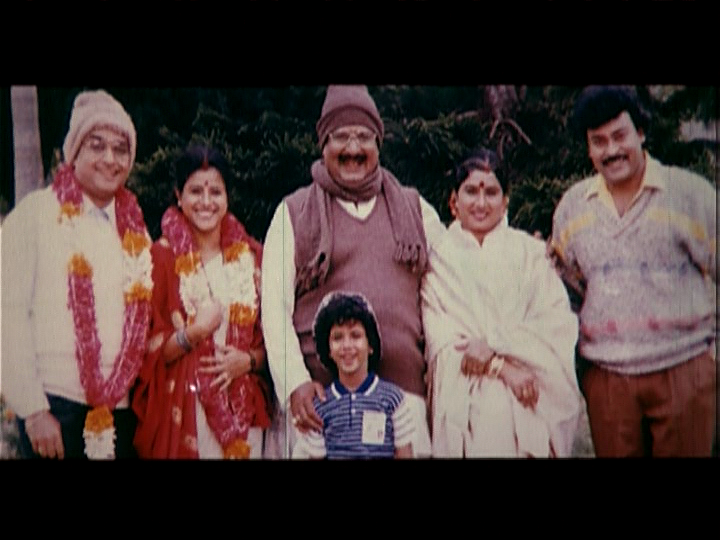 This seems to be an excuse for the wardrobe department to go mad buying a natty selection of sweaters for Chiru. Meanwhile, the fraudsters make efforts to cover their tracks and enlist the help of their partner in crime, the cat owning axe-murderer and construction contractor, Ranjit Kumar. On a trip to Bombay, Venkat Raidu (Kota Srinivasa Rao) and Papi Kundalu (Allu Ramalingaiah) find Johnny, an auto driver who is the exact duplicate of Kalyan. They hatch a plot to get rid of their boss, put Johnny in his place and then take over the company. Never one to resist a beautiful woman, Johnny dances up a storm to a bonus Bappi Lahiri song with the amazing Disco Shanti. Despite the fact that this was a film released in 1991, Disco Shanti’s outfit looks to have been stolen from Sam Fox circa the mid eighties. Luckily they are in fine form, and more than ready to take on the dubious choreography and make it their own. This may be the song that taught young Charan how to handle a fire hose. Kalyan is in love with Madhavayya’s daughter Sita (Shobana) who has the good sense to be a lawyer. This comes in very handy later on when the hapless Kalyan is accused of murder and thrown into jail. Rekha (Divya Bharti), the daughter of Venkat Raidu, hatches a scheme to marry Kalyan. Rekha does genuinely seem to love Kalyan but her father just sees the marriage as a way to control his nephew and the company. Naturally when she throws herself at Johnny thinking he is Kalyan, Johnny is delighted while Venkat Raidu desperately tries to separate the two. Shobana doesn’t get much screen time at all, although she does make a lovely pairing with Chiru. Most of the romance is provided by the interactions of Johnny and Rekha, relying heavily on comedy, mistaken identity and innuendo. Divya Bharti throws herself at Chiru with wild enthusiasm and really, who can blame her. 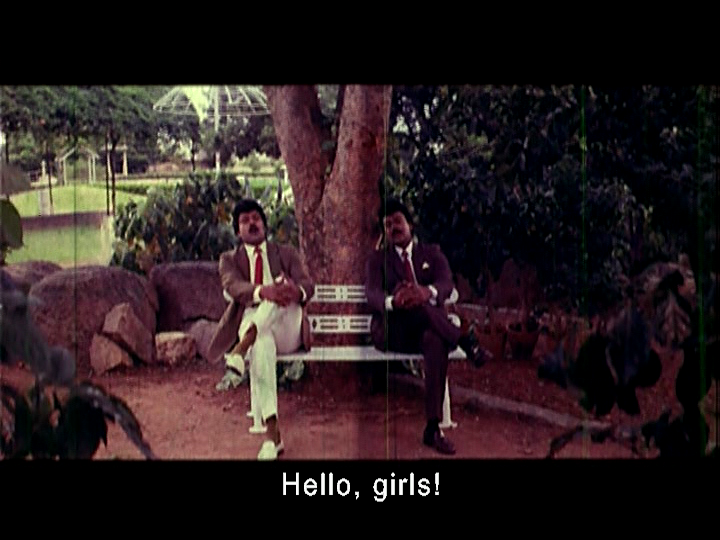 The success of the film rests on the portrayal of the two characters by Chiru. He exudes class and style as Kalyan and is also convincingly vulnerable when his family is attacked. 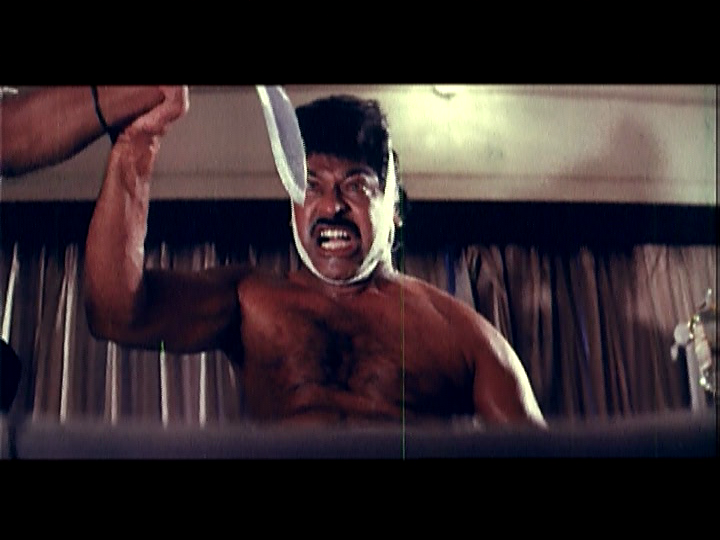 Johnny is as rough and tough as they come and Chiru makes him a different character in every respect. Kalyan has a blow-waved mullet and neatly pressed trousers, Johnny has a more exuberant moustache and prefers the timeless plaid and denim combo. 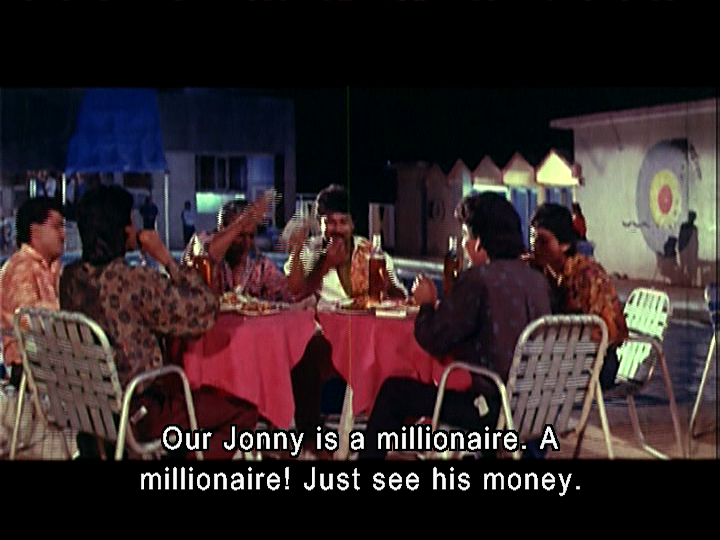 Johnny’s attempts to impersonate Kalyan are laughable, but since he is supposed to convince everyone that Kalyan has become crazy that works perfectly. 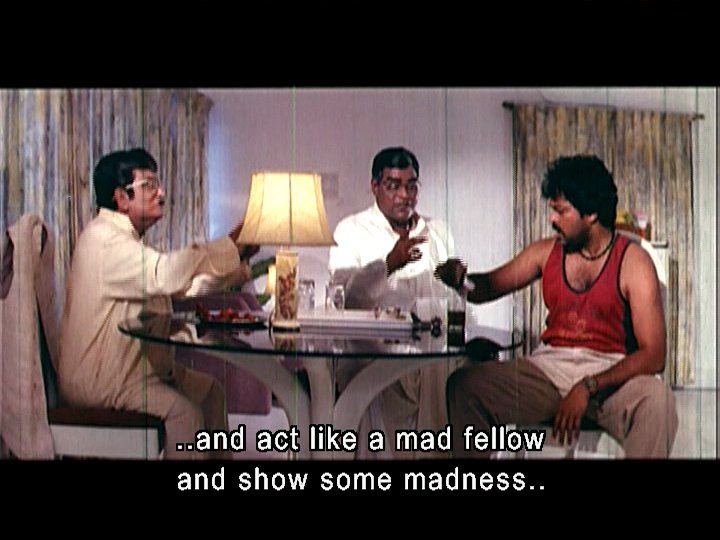 A very youthful and bald-spot free Brahmi makes an appearance as the psychiatrist enlisted to pronounce Kalyan insane, but most of the comedy falls to Chiru as Johnny and he does an excellent job. The two fraudulent employees also ham it up with their inept schemes and it’s left to Ranjit Kumar and his henchman to provide the real menace. The songs are mainly featured on Chiru and Divya Bharti and are upbeat as expected from Bappi Lahiri, with some interesting choreography by Prabhu Deva among others. There is one romantic song with Shobana in Switzerland which is quite subdued choreographically, but still contains potentially scarring images of mouth to mouth grape transfer technique. Chiru and Divya have an interesting encounter with some rather obvious symbolism of melting candles, dripping wax and a lot more besides. And we would love to know what the meaning was behind poor Divya getting hit in the face with suspended fruit. More fruit! There was a theme here, but we just don’t know why. The costume designers also seem to have gone crazy in the local DIY store for some of the outfits and must be applauded for their belief that almost anything can be used as a headdress. We enjoyed the scene in the hospital when Kalyan’s father’s heart beats in Morse code. There doesn’t appear to be any reason for this but is one really needed? Did it say anything significant? Are there any Telugu Morse Code experts out there? Johnny is obviously a man of steel as he is able to emerge from a coma and go straight into a major fight without so much as needing a bandage change. We know that the story doesn’t have to make sense, but the police do seem to be particularly inept On learning that Kalyan has been arrested and subsequently escaped, Johnny promptly flies back to Hyderabad. Surely the police would have been deployed at the airport looking for the escaped felon Kalyan? And since Kalyan and Johnny were identical it seems likely that the police might just have spotted Johnny returning to the city of his crimes. Perhaps they were looking for someone escaping from Hyderabad rather than entering the city so he was able to sneak in while their backs were turned. Or are we over-thinking this? Chiranjeevi is in his element and much of the film’s appeal lies with him, but his co-stars all turn in excellent performances to make this very entertaining. There is so much packed into this film with plenty of twists, plots and counter plots making it chock-full of masala goodness. 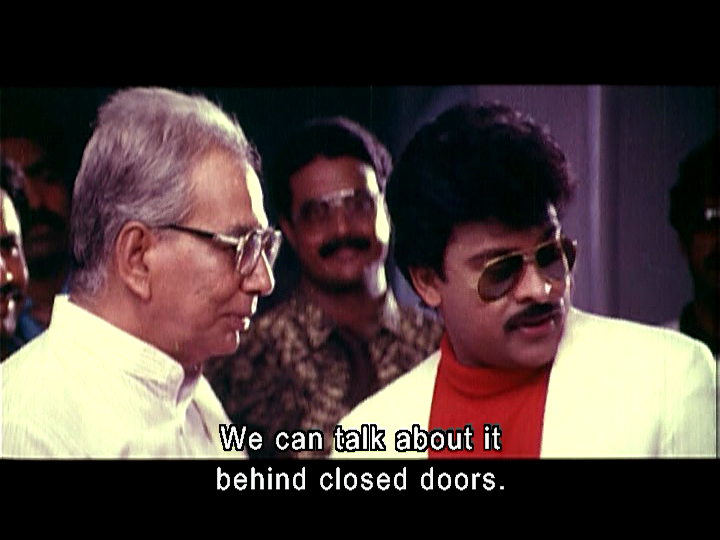 Temple says: This is not my favourite Chiru film, but it is very entertaining. All the requisite elements are there – fighting, flirting, bad denim, a sobbing mother, songs and multiple double-crosses. The comedy track is well integrated into the main story, and both Allu Ramalingaiah and Kota Srinivasa Rao make the most of their characters. Brahmi’s appearance is forgettable as he really doesn’t do much apart from fulfill what seems to be a law that he must appear. Divya Bharti plays an airhead and manages to be likeable enough but between her squeals and the wardrobe excesses, I was a bit over her character in a very short time. Shobana has less screen time but makes a stronger impression for me, as she down played a lot of her scenes and gave Sita a bit of presence. She might not have gotten a big dance number, but seeing what the costume team did to Divya, that may not be something she regrets. 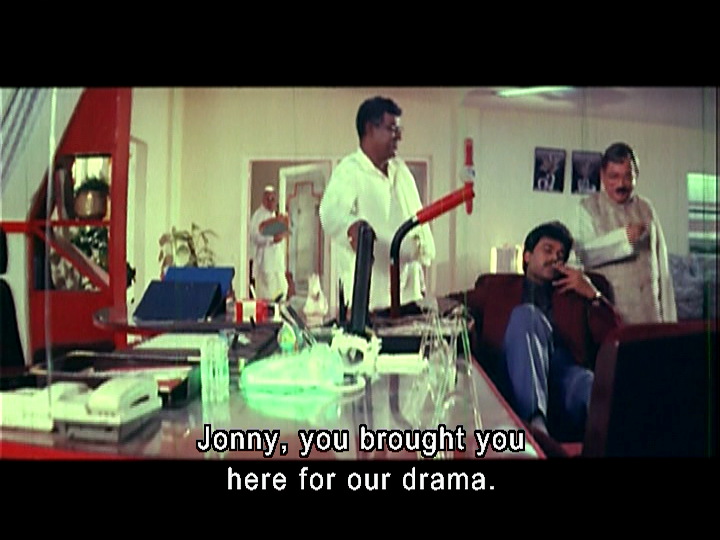 Chiru manages the characterisations of Johnny and Kalyan very well, and aside from obvious styling changes, his facial expressions and enunciation help keep the two roles quite distinct. It’s a fun film, if not a great one, and the songs are certainly memorable! I give this 3 and 1/2 stars. Heather says: Perhaps it was the return to Telugu Masala after a month of watching only Tamil movies, or maybe just because it’s twice as much Chiru, but I really enjoyed this film. The songs were particularly entertaining although I’m not sure if I can say that’s because of the dancing or just due to the unbridled enthusiasm of the wardrobe department! This was one of the films that made Divya Bharti a star in the south but I found her a little too loud and over-excitable. I thought Shobana’s performance was superior and it’s a shame she didn’t have more screen time. The film however belongs to Chiru and he separated his two characters very well, with differences in speech, posture and attitude clearly defining Kalyan and Johnny. I did appreciate the tasteful sweater collection used by Kalyan compared to the more garish choices often seen in Hindi films of the same period. The bumbling conspirators Venkat Raidu and Papi Kundalu are inept and amusing, while their partner in crime Ranjit Kumar seems to be an amalgamation of a number of classic James Bond baddies. Overall the story works well and the various twists and turns are satisfactorily dealt with to make this a fun watch. 4 stars from me! Our good friend Memsaab is trying to identify a particular function room and hotel swimming pool that feature in a lot of Hindi films. So imagine my delight when I saw The Pool in this film! This entry was posted in Tollywood and tagged Allu Ramalingaiah, Bappi Lahiri, Brahmi!, Chiranjeevi, Chiru, Divya Bharti, Kota Srinivasa Rao, Prabhu Deva, Rowdy Alludu. K Raghavendra Rao, Shobana, Telugu, Tollywood. Bookmark the permalink. Pasivadiki Pranam is on the now Everest-sized pile of films to watch! Arre yaar, don’t give me a hard time about the dubbed mess, I was buying some other DVDs from a website that’s not very well endowned when it comes to the Megaoeuvre, and I saw this one so I figured might as well put it in my basket. Let me assure you I bitterly regret my hasty decision, but kya karun… 😦 I will never do this again, it was honestly painful. Very fun film though. 🙂 I think my enthusiasm was partly due to the long gap between Chiranjeevi films for me – its been almost 6 weeks – so a double Chiru movie was practically obligatory. Awww… Thank you MM, you’re so sweet! 🙂 :-* I don’t remember much Chiranjeevi in the very beginning, so part 1 cand stay MIA all it wants. 😀 Thanks! Thank-you as well for the recommendations. I have Kodama Simham and Swayam Krushi in the (very large) pile of films-to-be-watched but sadly the copies I have don’t have subtitles. Since they’re Chiru though I’m sure they will be very watchable, even if we’re not totally sure what is happening! Its great to have so many films to look out for – thanks! Still trying to work through the last lot of recommendations! And a Chiru film inspired by the pink panther – that sounds like a ‘must-see’!